EXPERIENCE THE EVOLUTION! 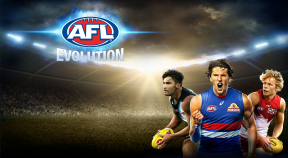 AFL Evolution brings you the most intense and feature packed AFL. Revolutionary new gameplay system designed to capture the thrills, skills and excitement of modern AFL. Featuring the latest AFL Draw & Fixtures. Now with online FanHub allowing you to create and share players/teams.